Add glow after every shower or bath with a pair of custom labelled massage/exfoliating gloves. Individually poly bagged with custom digital label. 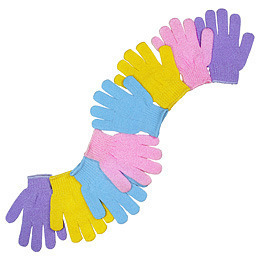 Two gloves (one pair) per pack. Colour(s): aqua/green, pale blue, bright blue, pale purple, bright purple, pale pink, yellow, white, red, bright pink, pale orange, bright orange.